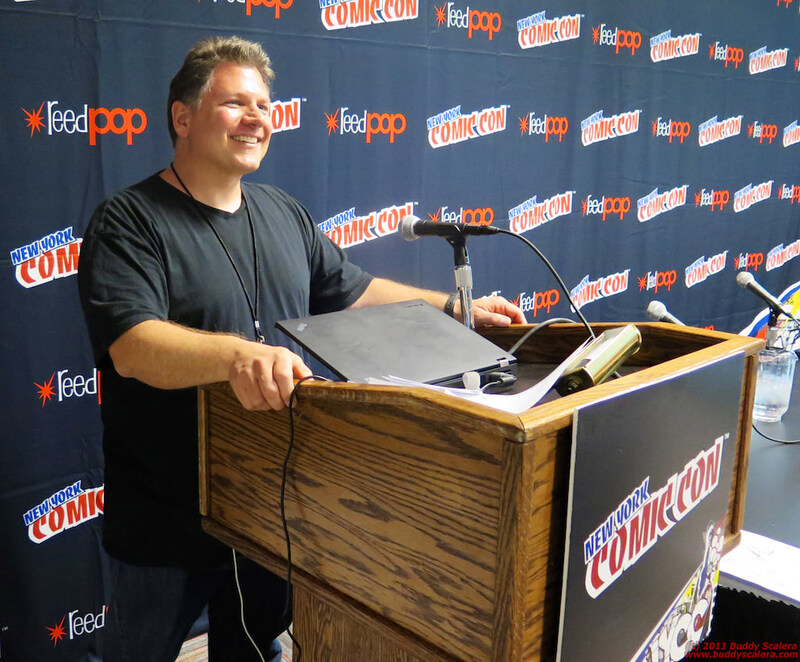 Buddy Scalera at the Comic Book School educational panels at New York Comicon. Buddy Scalera is an active and enthusiastic comic book educator. He has traveled to conventions all over the country to talk about how aspiring creators can improve their craft and break into the comic book industry. Early in his career, he hosted a news and education cable access television show called “ComixVision.” As writer, editor, and host, Scalera discussed comics and advocated for comic books in education. The show ran monthly for almost eight years and lives a second life in YouTube clips. Later, working for different industry publications like Comics Buyers Guide, Combo, and CVM, Scalera wrote journalistic features about comics. His column about comic books and technology eventually led him to a full-time career at Wizard Entertainment, where he launched the original online site “Wizard World Online” on America Online. With his collaborator Rus Wooton, Scalera pioneered online distance learning in the comic book industry with the seminal site “Wizard School.” The site offered aspiring creators the opportunity to be reviewed by actual working industry professionals. Through After Hours Press, Scalera published “Visual Reference for Comic Artists,” which was a three volume series of CD-ROMs. These CD-ROMs contained step-by-step art lessons by well-known creators like Sean Chen and Darick Robertson. These popular CD-ROMs eventually evolved into the “Comic Artist’s Photo Reference” series of books/CD-ROMs, all of which are published through F+W’s IMPACT line. Every year, Scalera plans educational events at local and national comicons. He has moderated dozens of live panels at New York Comicon, Wizard World Chicago, Wizard World Philadelphia, and the Long Beach (California) comicon. He typically plans and hosts panels and workshops with top creators. He is comfortable hosting and moderating in large rooms. One of his favorite (and most popular) events is the “Creator Connection” panel, which is a bit like speed dating for aspiring pros. This event has helped new creators launch careers, make connections, and publish numerous comic book titles. “Creator Connection” from New York Comicon 2011 was mentioned on BleedingCool.com. Scalera is available for public speaking events, sources for journalists writing articles, and for anything else that’s fun and adventurous. Contact him directly buddy@comicbookschool.com. Comic Book Shirts – Samples arrive.